Officers will train in more realistic scenarios. Singapore airport is using virtual reality to train emergency officers, and has just launched a new simulator to prepare for more complex challenges. Screens show emergency scenarios like plane crashes and passengers evacuating from burning aircrafts. Officers must navigate through these rescue scenarios by driving a simulated fire truck. It can show different weather patterns at different times of the day, and is built on a motion platform so officers are trained in a more realistic setting, a spokesperson from Civil Aviation Authority of Singapore (CAAS) told GovInsider. The simulator includes the layout of the upcoming Changi Airport Terminal 4 so emergency responders can familiarise themselves with the new floor plan. It can be deployed with three other fire truck driving simulators, allowing teams to collaborate during trainings. This will help sharpen command and control skills, and increase training capacity from 1,100 to 1,800 sessions each year, the Civil Aviation Authority of Singapore (CAAS) said in a statement. 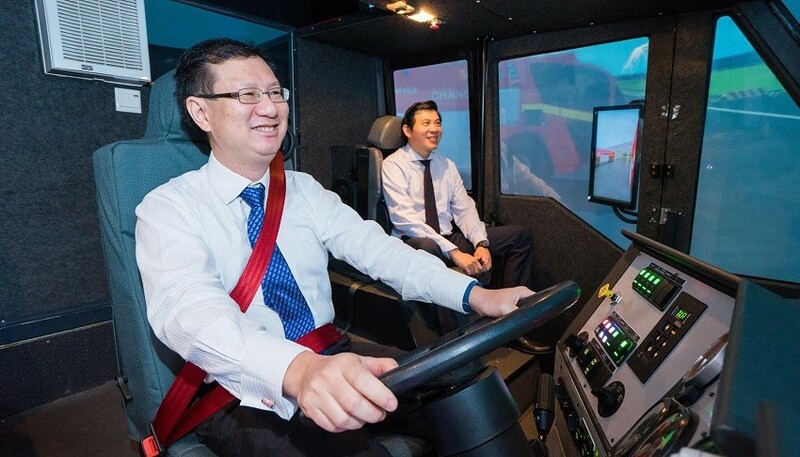 “The next generation simulator will help our [Airport Emergency Service] officers sharpen their operational readiness when responding to aircraft emergencies”, said Lee Seow Hiang, CEO of Changi Airport Group. The new simulator will be used in two emergency personnel training programmes to train both junior and senior officers twice a year, CAAS stated. The simulator was first commissioned in 2008 at a cost of S$2.2 million and has been upgraded for S$1 million. It was commissioned by CAAS on Monday.